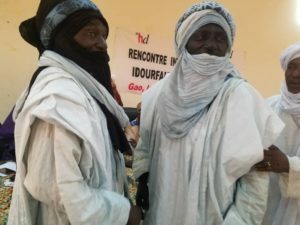 Idourfane and Ibogolitane communities from the regions of Gao and Ménaka in Mali and the region of Tillabéry in Niger, signed a peace agreement on 20 November 2018 in Gao, thereby putting an end to more than a year of deadly conflict between the two sides. The Gao Agreement, which is the result of a mediation process facilitated by the Centre for Humanitarian Dialogue (HD), was signed by six Idourfane and Ibogolitane leaders designated by their respective communities in Mali and Niger. Standing up against cattle theft and looting, whichever community is being affected by the latter, and facilitating the search of the stolen livestock and goods to be returned to their owners. Following up on the Agreement’s implementation and reporting back to the communities on the latter, on a regular basis. This Agreement puts an end to more than a year of intercommunal clashes which have caused the death of more than sixty people over the last six months. The conflict, which originates in a struggle for access to the region’s natural resources, currently affects 9 municipalities in Mali and 4 of them in Niger. The mediation process, which was initiated at the request of the communities themselves, brought together all the parties which have an influence over the conflict, including leaders of the Fulani community, women and youth representatives from both communities, as well as the armed groups which have taken part in the clashes (the ‘CMA’, the ‘Platform’ and the ‘MSA’). Malian and Nigerien authorities have also been kept closely informed of the mediation process by HD. “It is important that the communities pursue a close dialogue with Malian and Nigerien authorities in order to guarantee the Agreement’s implementation and sustainability. The signing of the Agreement will not put an end to the violence between the communities overnight, but represents a solid basis on which they can rely to manage their disputes in a negotiated manner,” said Abdelkader Sidibé, HD’s Head of Mission for the Sahel. In this fragile context, HD will also support the Committee in charge of monitoring the Agreement’s implementation. Set up during the accord’s signing, the Committee comprises representatives from both communities. The Gao Agreement falls within HD’s broader mediation efforts which seek to help stabilize the border regions of Mali, Niger and Burkina Faso. HD would like to express its gratitude to the Kingdom of Denmark for its support to its activities in the Sahel region. For further information, please send an email to: pr@hdcentre.org.